See WE CAN all just get along! i’m getting my hair cut today, i’m getting my hair cut today….oooo oooo ooo i’m getting my hair cut today. YEAH! 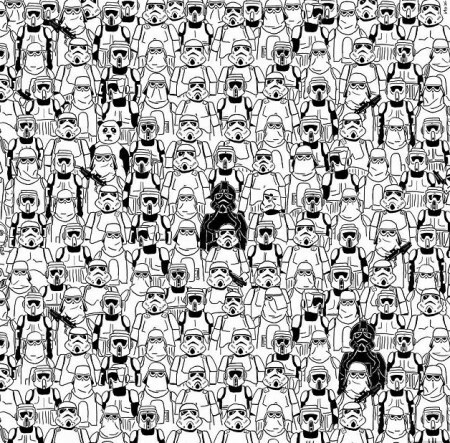 Find the panda hiding among the storm troopers! Somewhere in the midst of what appears to be a convention of Star Wars aficionados, a panda is lurking. See if you can find it. “To groan, weep or pray is the coward’s disgrace. Although Vigny gained success as a writer, his personal life was not happy. His marriage was a disappointment; his relationship with Marie Dorval was plagued by jealousy; and his literary talent was eclipsed by the achievements of others. He grew embittered. After the death of his mother in 1838 he inherited the property of Maine-Giraud, near Angoulême, where it was said that he had withdrawn to his ‘ivory tower‘ (an expression Sainte-Beuve coined with reference to Vigny). There Vigny wrote some of his most famous poems, including La Mort du loup and La Maison du berger. Proust regarded La Maison du berger as the greatest French poem of the 19th century. In 1845, after several unsuccessful attempts to be elected, Vigny became a member of the Académie française. In later years, Vigny ceased to publish. He continued to write, however, and his Journal is considered by modern scholars to be a great work in its own right, though it awaits a definitive scholarly edition. Vigny considered himself a thinker as well as a literary author; he was, for example, one of the first French writers to take a serious interest in Buddhism. His own philosophy of life was pessimistic and stoical, but celebrated human fraternity, the growth of knowledge, and mutual assistance as high values. He was the first in literary history to use the word spleen in the sense of woe, grief, gall, descriptive of the condition of the soul of modern man. In his later years he spent much time preparing the posthumous collection of poems now known as Les Destinées, for which his intended title was Poèmes philosophiques. It concludes with Vigny’s final message to the world, L’Esprit pur.